t of modern commerce ; it glowed, sparkled, and scintillated, fresh from the hand of the master, seeming to proclaim in unmistakable accents, " my creation was a labour of love/' And why was this ? Simply because the execution was entrusted to the most gifted artist-craftsmen that could be found, and because when found they were munificently paid. The price of a single mount, in many instances, would be ample to furnish completely and comfortably many an ordinary house nowadays. We cannot, therefore, institute a comparison between such work and the stock brass mounts of to-day, which are produced according to a stipulated and by no means too generous price, and sold over the wholesale ironmonger's counter at so much "per set." The comparison would not be fair. It is only just, indeed, to say that, even in these so-called degenerate times, French ormolu, as fine as any ever produced even in the palmiest days, can easily be obtained by those who are in a position, and prepared, to pay for it. 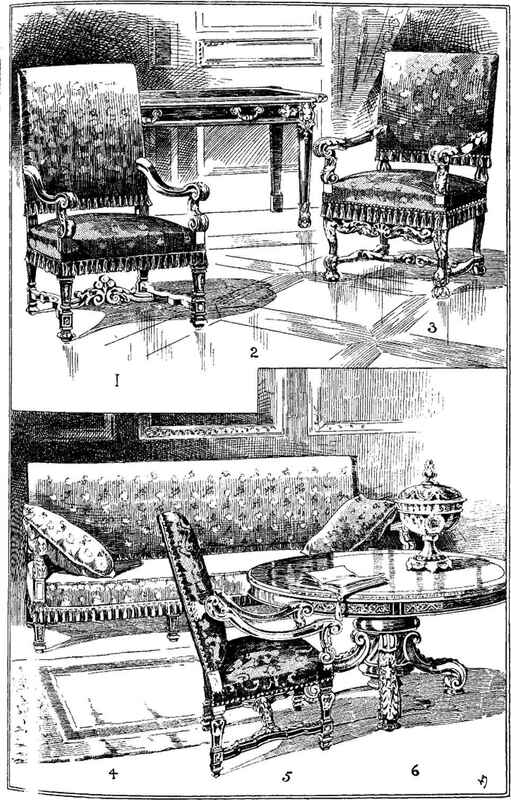 Justice cannot possibly be done by mere pen-and-ink sketches to many of these old masterpieces of the metal worker's craft, but their form and character can be indicated by such means, and with that we must, for the time being, rest content. 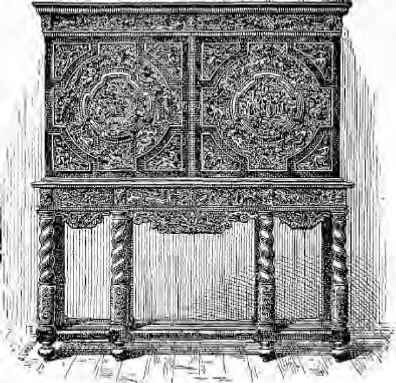 I will ask the reader, then, to note the massive foliated mounts, with the female head and lion's paws, th^t apparently support the centre projection in the armoire, Fig. i, Plate L; also the figure of the king in old classic garb, and the military trophy above. These are designed after the dignified martial manner common to much " Louis-Quatorze " decoration, and intended to symbolise the military prowess of the monarch, to curry whose approbation and favour it was conceived. There was more than a suggestion of the old " Roman " about it all, a characteristic which later on developed to a remarkable degree in the "Empire," as we shall see in a succeeding chapter.